Fast Forward – Start to Finish. Work in Process. My favorite creative times are all about the time I enjoy at the easel. But a lot more goes into a painting than just easel time; photography, preparation, painting, the finish work – all that and more goes into creating a successful artwork that my collectors and I can be proud of for a lifetime. 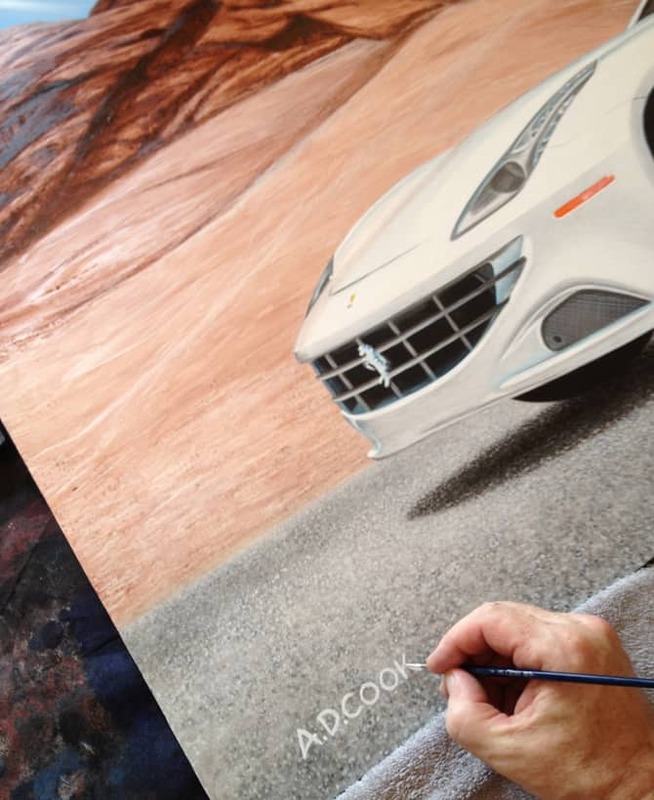 I’ve been wanting to put together a WIP (“work-in-progress” or step-by-step) post on FAST FORWARD, my newest canvas original featuring the Ferrari FF since finishing her last month. I took a lot of great shots to share my process of creating this painting with you, which measures 36″ x 60″, and created in acrylic on specially-prepared canvas. 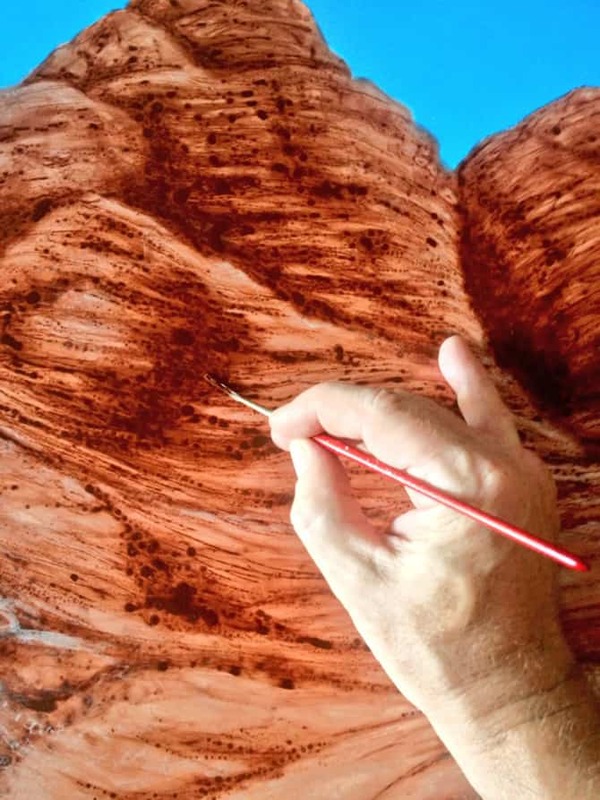 While, this post isn’t designed to teach you how to create this artwork, it’ll give you a good idea of what goes into my paintings. Before any painting begins, I need to take some reference photos of the car and its details. 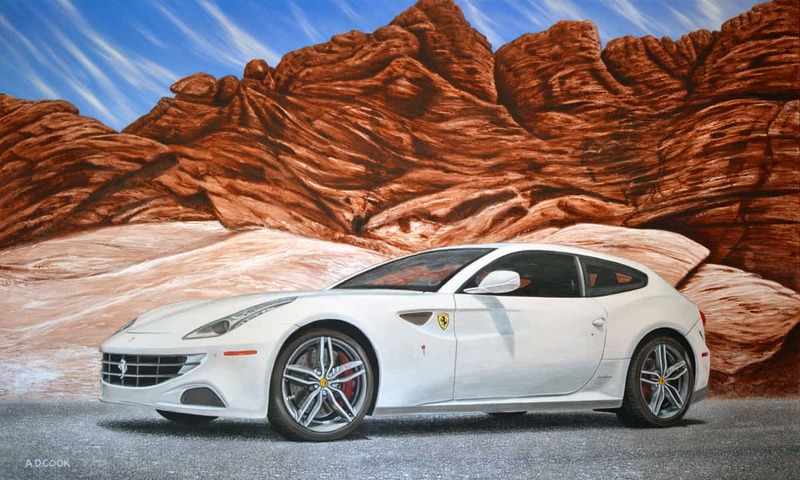 This painting started off beautifully as my collector and I took his Ferrari FF to the Red Rock mountains just outside of Las Vegas, NV. It was a perfect day too for a leisurely drive in a truly unique Italian exotic. So naturally, as was the plan, we stopped and I took plenty of pictures of the FF with those timeless majestic mountains as my setting. Those shots became the reference images for my painting. Next step – canvas prep. 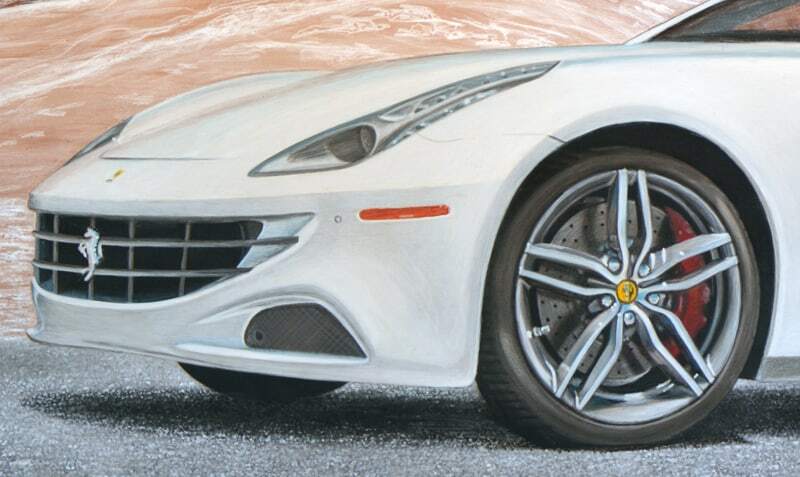 My Ferrari painting is created almost entirely with small artist paint brushes, so I prepared my canvas to create a slate-smooth surface, ensuring that I could include more close-up detail than a standard off-the-shelf canvas allows. 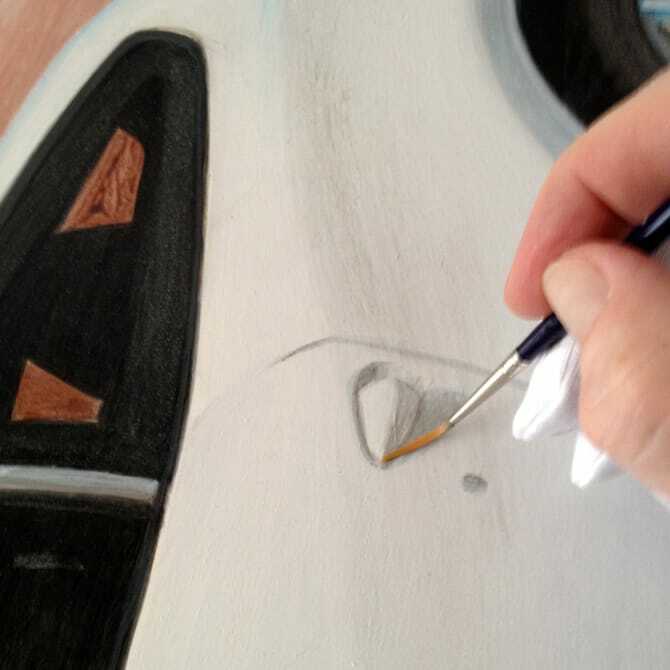 See my article titled “Creating the Perfect Ultra-Smooth Canvas” for some insight to my canvas prep process. Working on a smooth surface makes it possible for me to paint more details, which is especially great for things like cars. After a dozen coats of gesso applied with a 3″ x 5″ squeegee one coat at a time over as many days, followed by lots of fine wet sanding, my canvas prep is complete and have the perfect surface for my painting. My next step is a apply a few coats of reduced Auto Air pearl white with an Iwata spray gun. That part is pretty straight-forward. After a couple weeks work the canvas is finished and looks more like a beautiful sheet of pearl paper than canvas. The surface is smooth with no visible canvas texture. 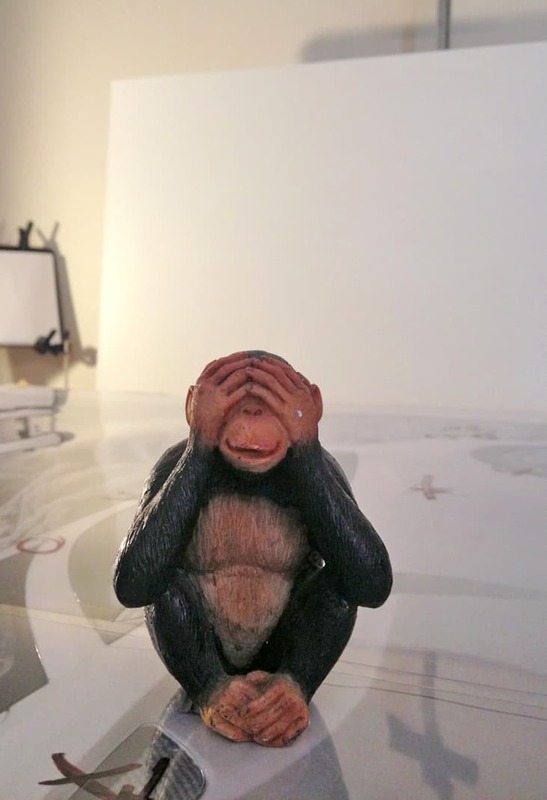 See no evil – all is good in the studio… Art Monkeys with the ready-to-paint canvas. The canvas prep stage takes me about and hour or two a day so during the canvas prep stages I develop my drawings and notes, templates and whatever else I need. Preparation is key in creating these large realistic paintings. Ideally, I’m ready to start the painting about the same time the canvas is ready to be painted. Preparation is key in creating these large realistic paintings. I typically work on my paintings back-to-front, so in this example it’s sky > mountains > asphalt > car > emblems… and so on. The sky and clouds are airbrushed but literally everything else was painted with small artist paint brushes. So, as it goes, I enjoyed countless hours at the easel painting detail upon detail until I achieved this big bold piece. Placing the canvas flat for these stages helps since I wanted to paint much of the mountain wet-on-wet to create exciting variety and texture. 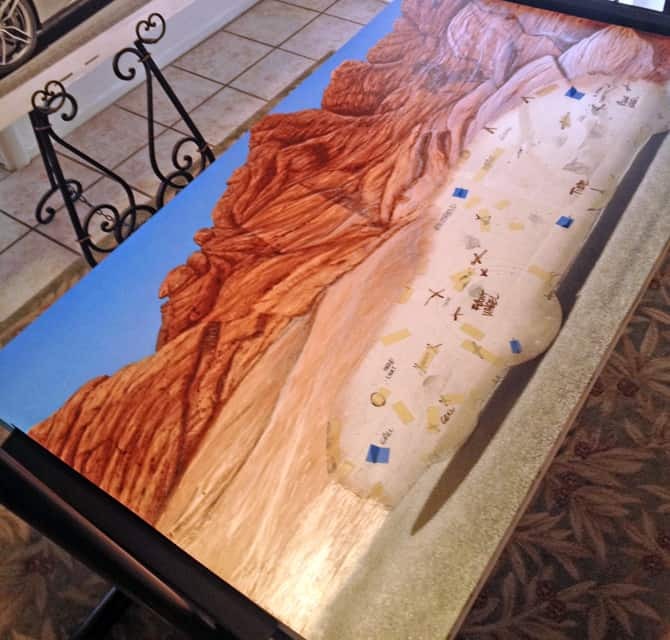 Initially, the mountain area of the painting was protected with acetate while the sky was painted in a blend of Auto Air blue tints using an Iwata HP-C airbrush. Like the background white, the sky is painted with pearl colors. Then the acetate is removed exposing the mountains and asphalt while leaving the car covered in acetate to keep it clean for a while. The asphalt and mountains are next on my list. Using small brushes I painted the ground with thousands and thousands of small dots and specs of grays and blacks to create the illusion of asphalt. Because of the layered pearl paints the mountains change color as the light changes. …like the Italian stallion (Ferrari horse) in the mountains reflecting the passion and spirit of the many horses that once freely roamed these hills. And if you look straight up from the front wheel there is a Nevada map in honor of my collector, a lifetime Nevada resident. At this point the sky, mountains and ground are looking good. I’m starting to think about the car and my next steps. In the shot above, the car is still covered in acetate to protect it from my fast and loose brush strokes from earlier. In preparation of this stage I’ve essentially created a big acetate puzzle. My notes, written in Sharpie all over my acetates will help me keep things in order as I move forward. 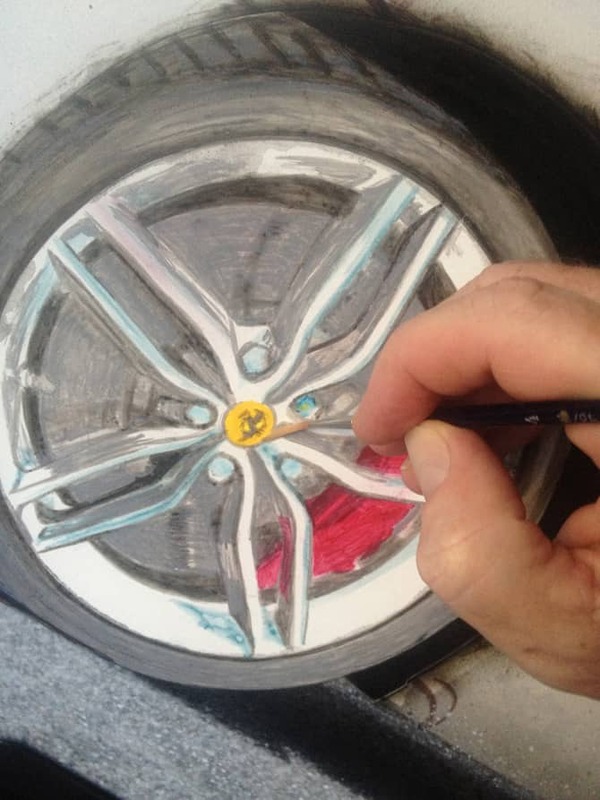 Ferrari front wheel in process. Excited to get going on painting the car, I start with the wheels and tires. After removing the acetate, I block in the general colors and shapes with small paint brushes. I’m not too concerned with detail at this stage — I’m just blocking in big shapes and values. 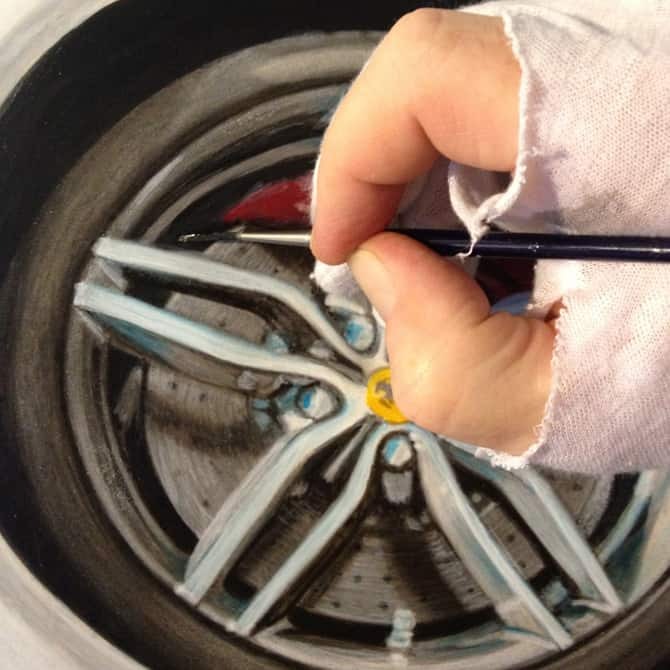 Ferrari front wheel in process, con’t. Over time the details present themselves and the painting is starting to take shape. At this point I’m adding details not just to the car, but all over. Rocks get more details, clouds are added, and the car is now more connected to the ground with lots of fun shadow work. 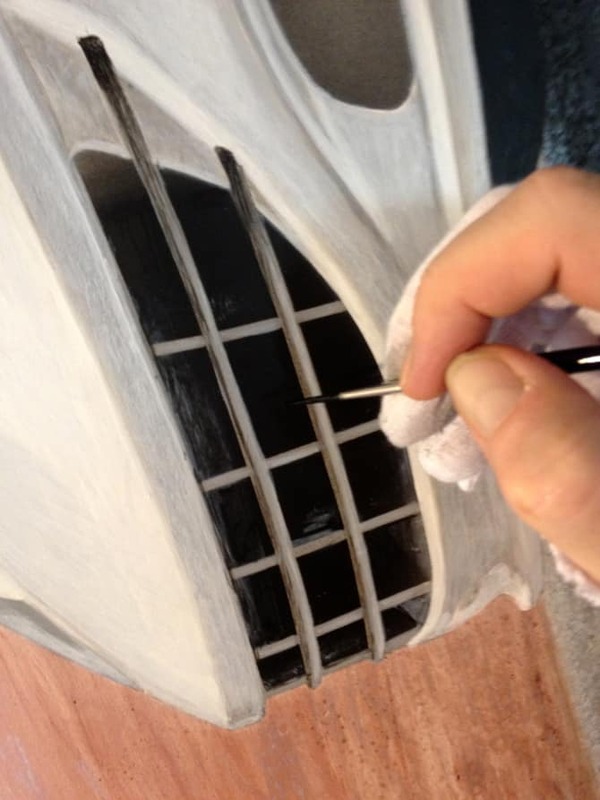 Door handles and other details are painted, one stroke at a time. The beginning of the grill area. Finally, my signature. Of, course, the signing of a painting just means it’s down to a couple more steps. Next up is painting the edges of my canvas – in this case FAST FORWARD has a nice black finish so it can be displayed sans frame. Then it all gets cleared with a UV protecting spray applied with a spray gun. Finally, felt pads are applied to the back corners and picture wire is installed, making this painting finished and ready-to-hang. The experience of painting is, for me, a relaxing and quiet process of just making time for the easel. Beyond tons of details, some special features in this painting include pearl mountains that shift colors as the day’s light changes. 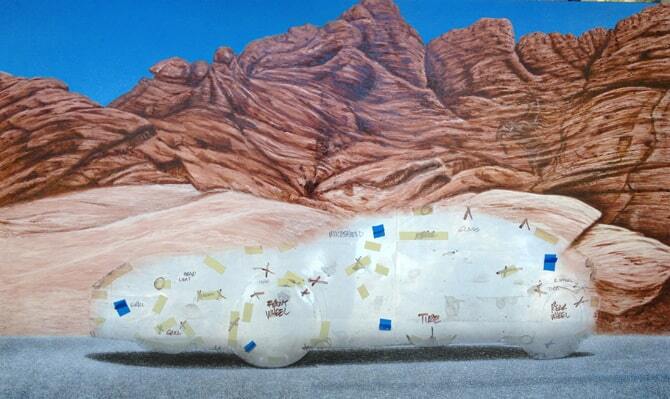 Look closely for the Ferrari Italian stallion hidden within the rocks along with a Nevada map. I really enjoyed creating FAST FORWARD. All-in-all, from start to finish, this painting took me about six weeks to complete. I’m looking forward to spending more time at the easel with these beautiful ladies. Italian cars, American motorcycles, airplanes… I enjoy painting them all. Contact me to schedule your special creation ( adc – at – adcook – dot – com ). 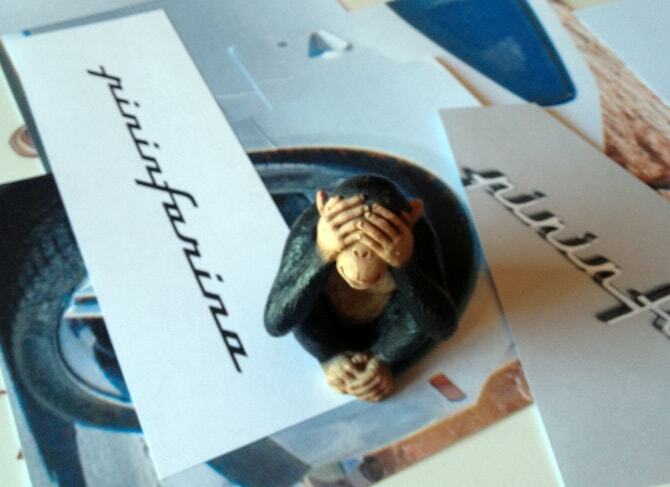 Going forward and shifting gears is what my art is all about. I’m very excited to continue this line of original artworks. Stay tuned for my next original painting or join my email list for updates ( email.adcook.com ). I am proud to announce that FAST FORWARD is on permanent display at Red Rock Harley-Davidson, the largest H-D dealership in Las Vegas. Stop in anytime to view FAST FORWARD in person. It’s a huge store, so the easiest way the painting is to enter through the main doors, look to the left. 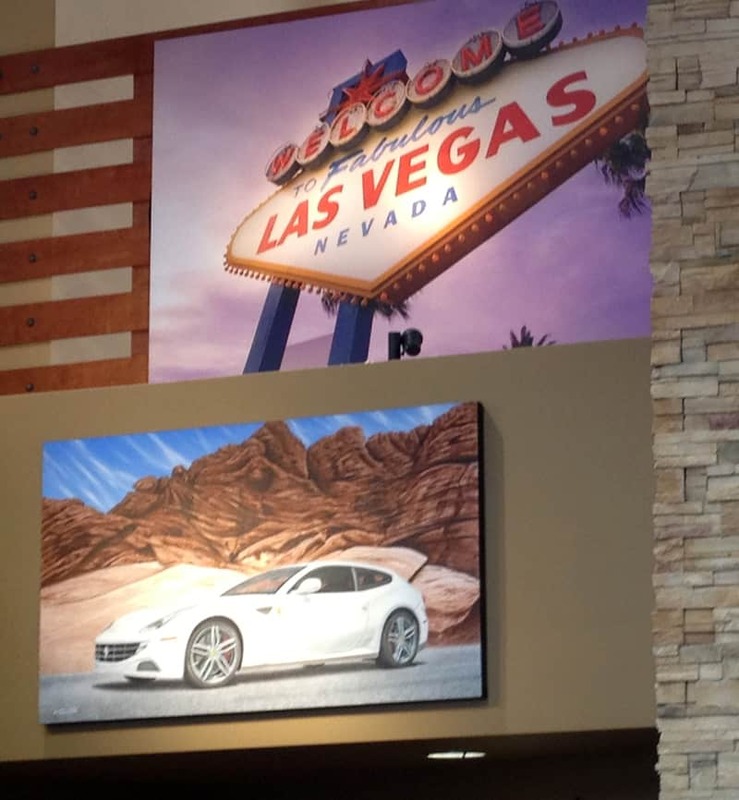 FAST FORWARD is displayed near the Sale Offices below the large “Welcome to Fabulous Las Vegas” sign wall graphic.